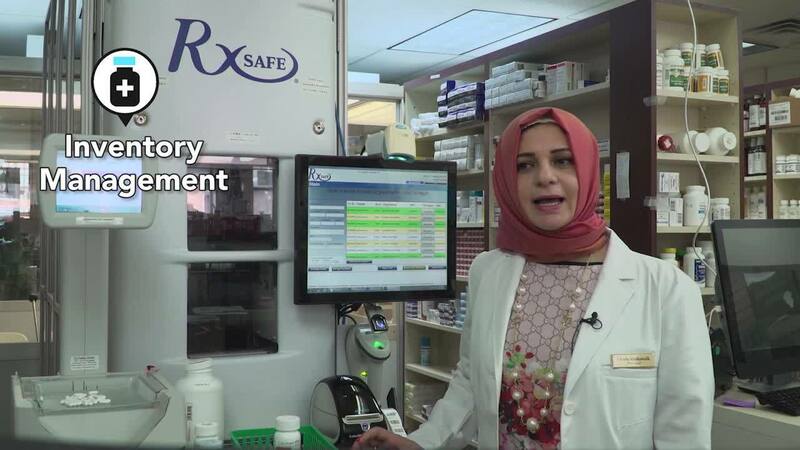 Ghada Abukuwaik, head pharmacist and owner at CureMed Pharmacy in New Jersey, has been a pharmacist for more than 20 years. Even with all that experience, she was surprised how much the RxSafe 1800 changed her pharmacy’s workflow, for the better. CureMed, which is a certified diabetic wellness center, also does adherence packaging, MTM, home visits and other clinical services for its patients. “When we purchased the RxSafe we were striving to improve accuracy, safety, time efficiency and inventory management,” Abukuwaik says. “Before installing the RxSafe, we had a minimum of three technicians filling prescriptions. Now, I only have one technician filling prescriptions.” The other two technicians have been freed up to work on more profitable services, Abukuwaik says. Abukuwaik was also impressed by the RxSafe 1800’s ability to save precious pharmacy floor space. A 3-tower RxSafe 1800 system can hold virtually all of a pharmacy’s oral solid stock bottles: up to 5,400 stock bottles in 40 square feet of space. That means pharmacy owners can avoid remodeling, and grow revenues by gaining additional floor space for additional income. The RxSafe 1800 is a closed and locked inventory system that guarantees unprecedented inventory accuracy, theft prevention and security for all drugs. Stock bottles are stored behind locked doors, and any discrepancies are tracked by user. “My very favorite feature of the RxSafe is the inventory management,” Abukuwaik says. “It’s phenomenal, exceptional, amazing! We now carry approximately 50% less inventory than before the RxSafe,” she says, adding that the RxSafe 1800 has improved CureMed’s inventory turns, from an average of 11 to 18, and reduced the cost of having extra medication on the shelves. Abukuwaik also pointed out that the RxSafe’s ability to manage and check expiration dates has saved money for CureMed Pharmacy. "I like the time efficiency it has created for my pharmacy and how it improved our knowledge of what we have on hand. It really helps manage our inventory,” Abukuwaik adds. Workflow changes, inventory management and labor savings have added up to a positive return on investment for CureMed, Abukuwaik says. "My profit has improved significantly because there is now less cost due to inventory savings and only having the appropriate staff needed for the day.” Abukuwaik estimates that CureMed saves approximately $70,000 per year on labor and inventory savings alone. “I believe that I got back my investment on the RxSafe within the first year,” she concludes. For more information on the RxSafe 1800, visit our product page, or call 877-797-2332 now to speak with an automation expert.